Problem is the is still was. But now it’s not. Thanks to Rich Bloom for pointing out the change that will shake the social graph to its core. Richelle is says ‘Huzzah’ the is is no more! Thanks for the comments Richelle and Teena. 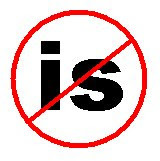 To me, the whole “kill the is” movement reflects just how much people care about the brands they love. Facebook still fits squarely in that category, despite its recent challenges with privacy issues and Beacon.